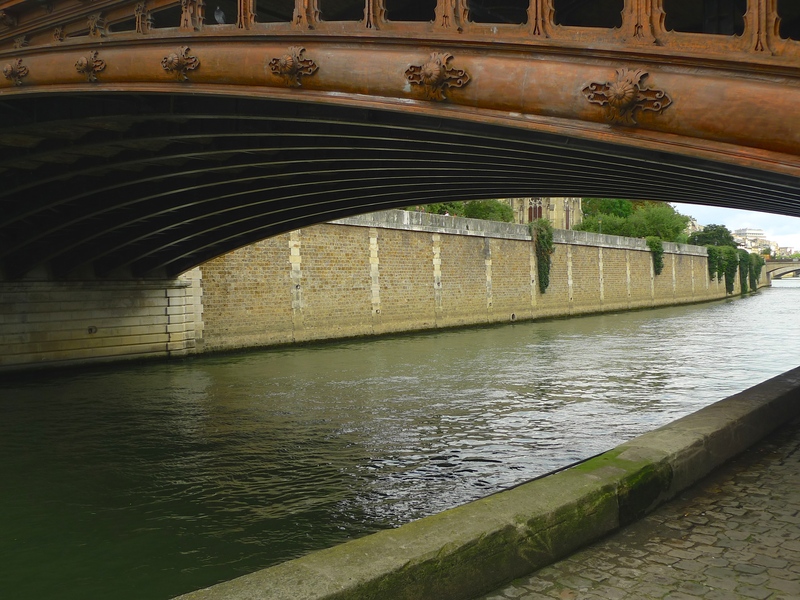 FURTHER RESEARCH FOR my Paris Bridges Project took me to the Pont au Double in the heart of Paris close to the Cathédrale Notre-Dame de Paris. 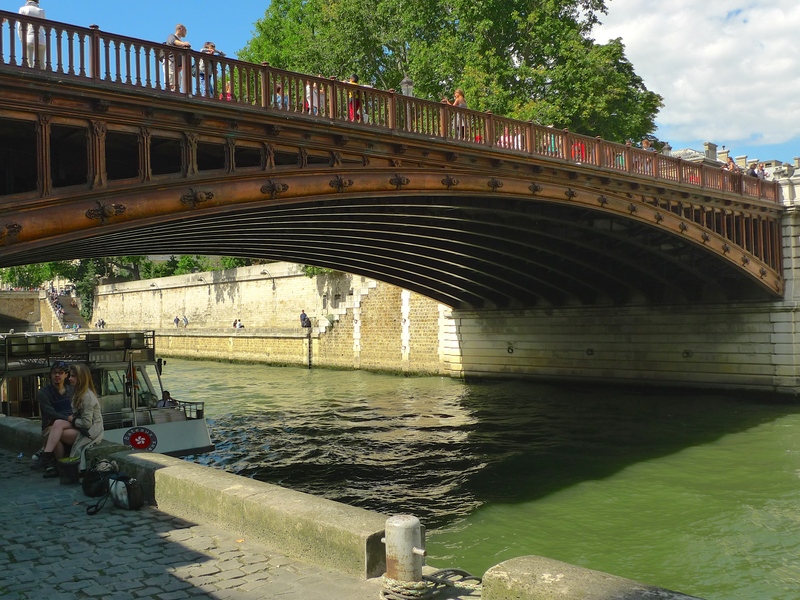 The Pont au Double is 45 metres long and 20 metres wide and it links the 4th and 5th arrondissements of Paris from the Île de la Cité to the quai de Montebello. 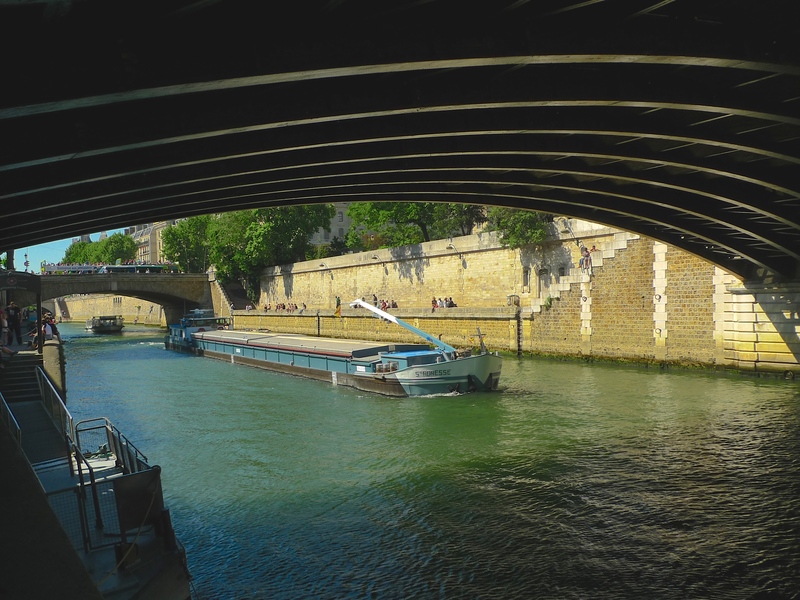 Work began on the first bridge to cross la Seine at this point in 1626. 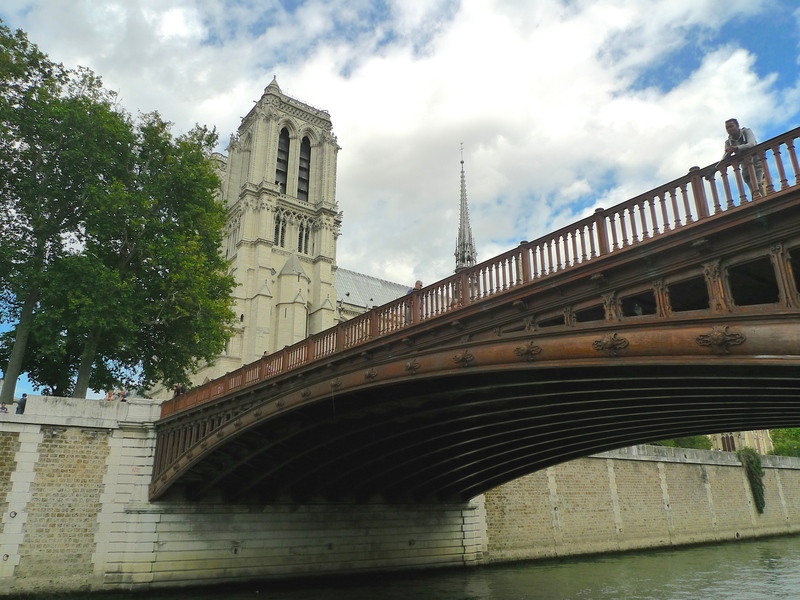 Designed by the French architect, Christophe Gamard, the bridge was deemed necessary as part of the development of the Hôtel Dieu, the oldest hospital in Paris. 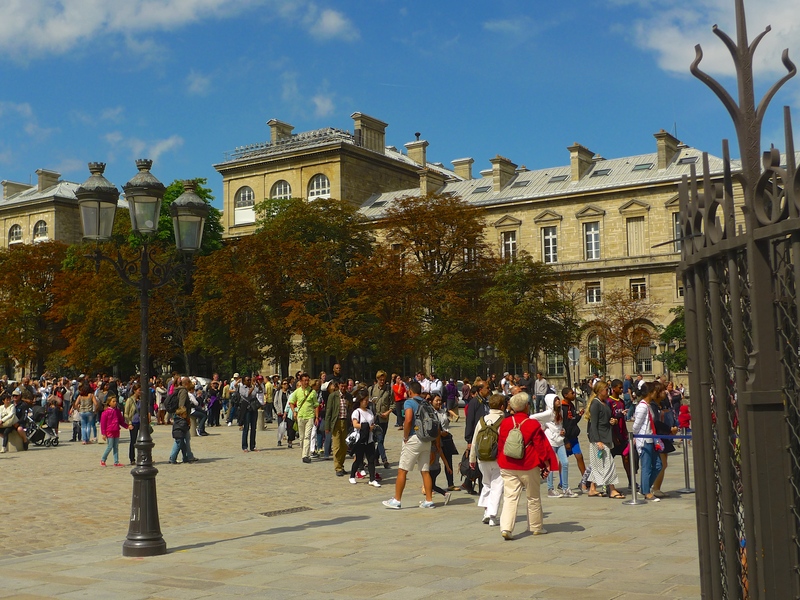 Originally, the Hôtel Dieu was situated on the opposite side of the parvis Notre-Dame (the square now known as Place Jean-Paul II) from where it stands today. 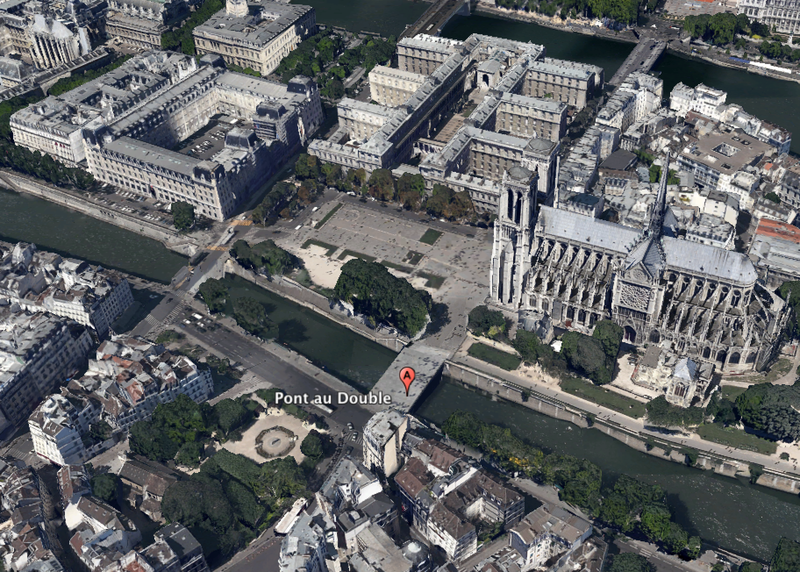 Then it was next to la Seine but during the Middle Ages the hospital had grown in an unplanned and rather chaotic way. By the early part of the seventeenth-century the Hôtel Dieu was grossly overcrowded, often with four patients to a bed, and in order to provide more space a part of the Hôtel Dieu had spilled over la Seine to occupy a parcel of land on the Left Bank. The new bridge was seen as a way of connecting the two parts of the hospital. The bridge was completed in 1634. It was a stone bridge on to which a two-story building was constructed which was used as extra hospital wards for the Hôtel Dieu. This building occupied almost two-thirds of the width of the bridge. It was decided that the remaining one-third should be open for public use for which a toll was levied. The proceeds from this toll were used to pay for the bridge. The toll to cross the bridge was a ‘double denier’, a denier being a medieval coin taking its name from the Frankish coin first issued (as the denarius) in the late seventh century. In English it is sometimes referred to as a silver penny. It was from this ‘double denier’ toll that the bridge took its name, the Pont au Double. In 1709, the original bridge collapsed and it was replaced with a new bridge, which survived until 1847. The Pont au Double we see today was opened in 1883 as a one arch cast-iron bridge designed by Henri-Prosper Bernard and Jules Lax. The other day, I went to explore the Pont au Double and I began by seeing what I could find under the bridge. 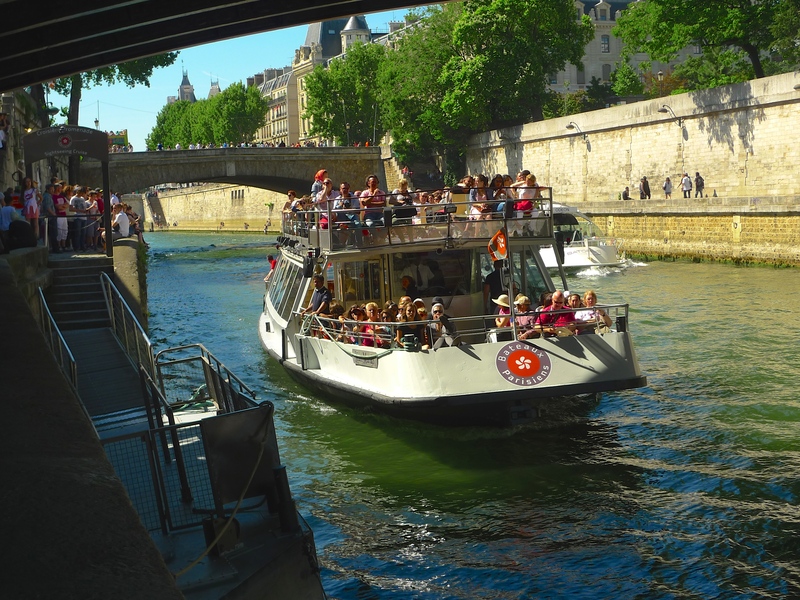 The first thing I discovered was that this is one of the embarkation points for the Bateaux Parisiens, one of the many tourist boats that ply la Seine. And it is the sounds of tourist and other boats passing that dominate the soundscape under the bridge. 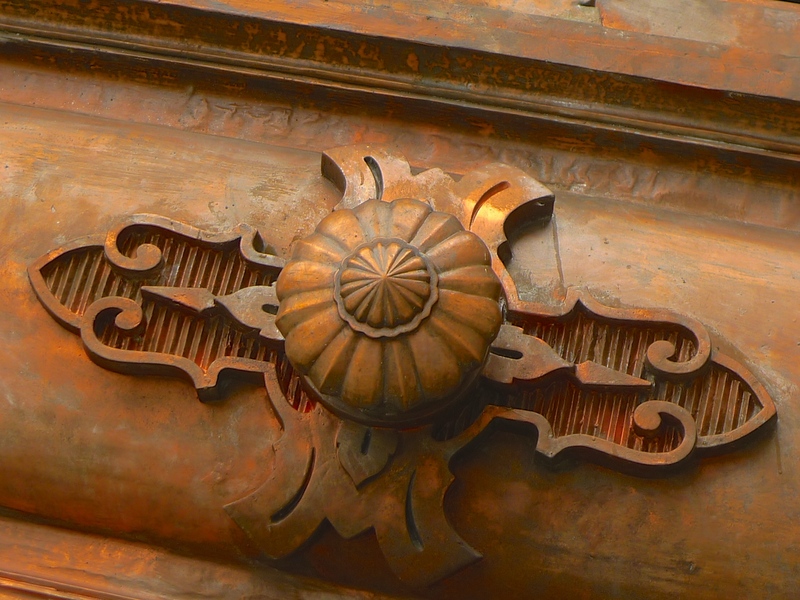 I was also reminded of two pieces of history as I was exploring the underside of the bridge. 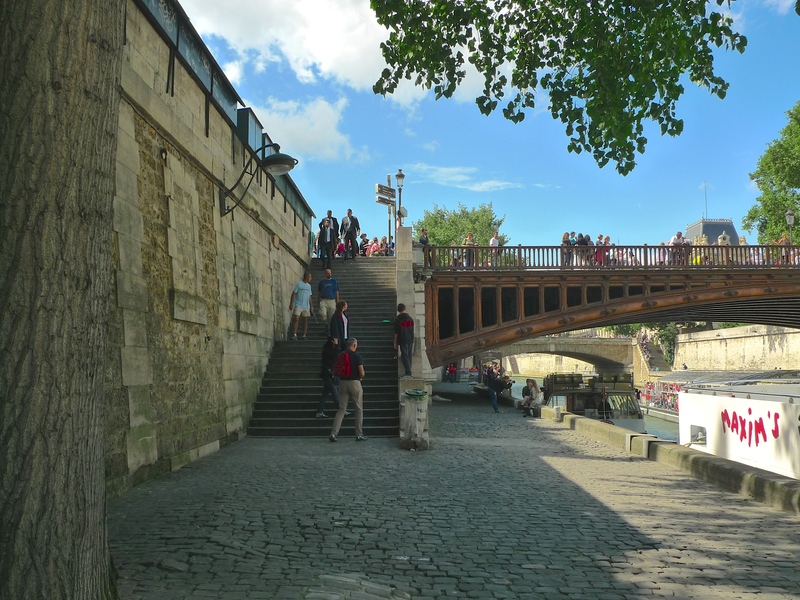 These steps leading down to the quai de Montebello reminded me that in the seventeenth century steps like these also emerged from the bridge onto the quay and la Seine. It was from here that the nuns from the Hôtel Dieu used to spend up to nine hours a day doing their washing and that of the sick and infirm from the hospital above. I was also reminded that in the seventeenth century this would have been rather an obnoxious place to be since the hospital poured its waste directly into the Seine around here. 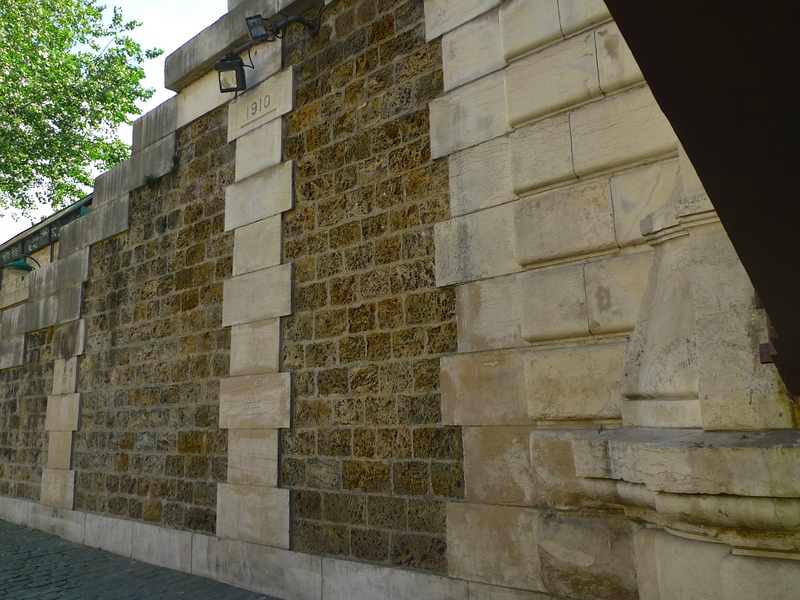 The plaque in the wall bearing the legend ‘1910’ reminded me that this was the height to which the Seine reached in the Great Flood of Paris in January 1910. Although the water threatened to overflow the tops of the quay walls that line the river, workmen were able to keep the Seine back with hastily built levees. Having explored underneath the bridge, I climbed up the steps from the quai de Montebello to explore the bridge from above. From here it is hard to imagine that in the seventeenth century hospital wards belonging to the Hôtel Dieu would have occupied two-thirds of this bridge, on the left-hand side. 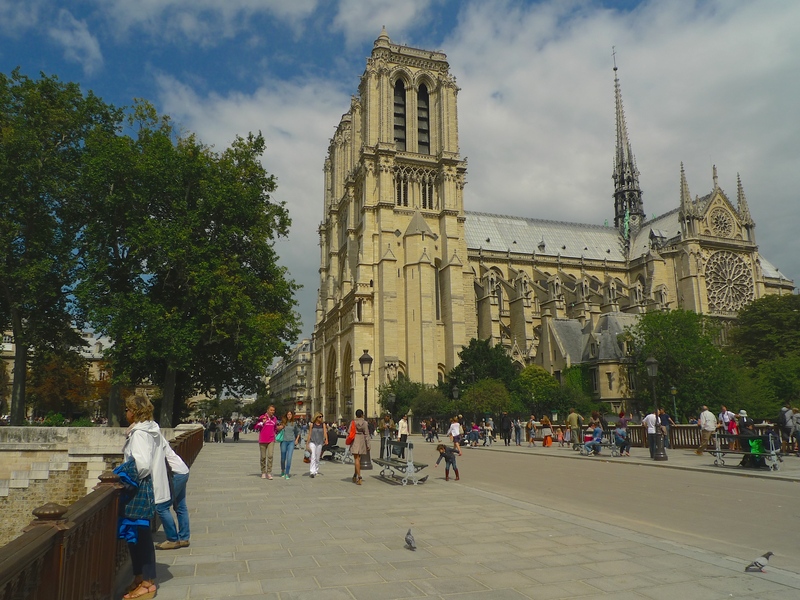 Today, the Pont au Double is a thoroughfare for tourists heading to or from the Cathédrale Notre-Dame de Paris. 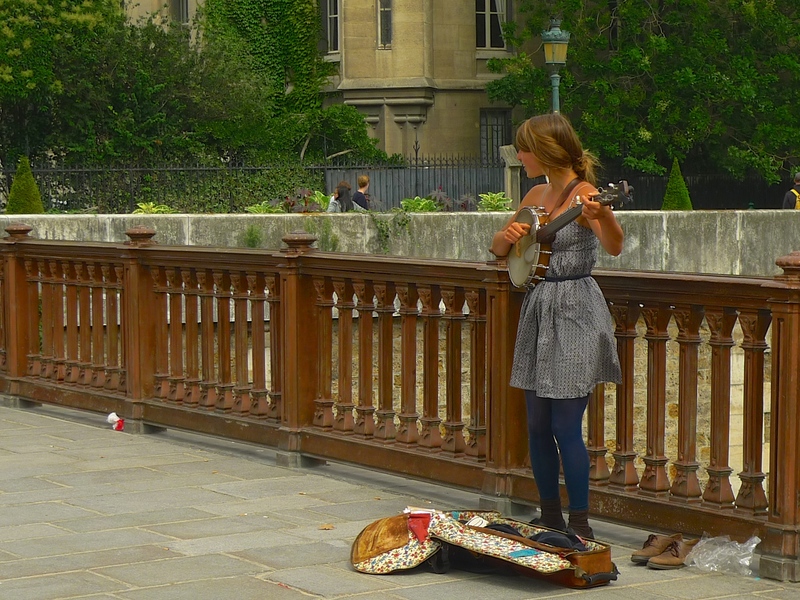 These days, no toll is required to cross the bridge but a pourboire, or a tip, is always appreciated by the street musicians who can often be found on the bridge. In my Paris Bridges Project I’m not only looking to explore the history of each of the thirty-seven bridges that cross la Seine within the Paris city limits, I’m also trying to seek out the characteristic sounds of each bridge and trying to identify any sounds that might be unique to each bridge. The soundscape under the Pont au Double with the sounds of tourist and other boats passing was fairly predictable but I found the soundscape on the bridge really quite interesting. 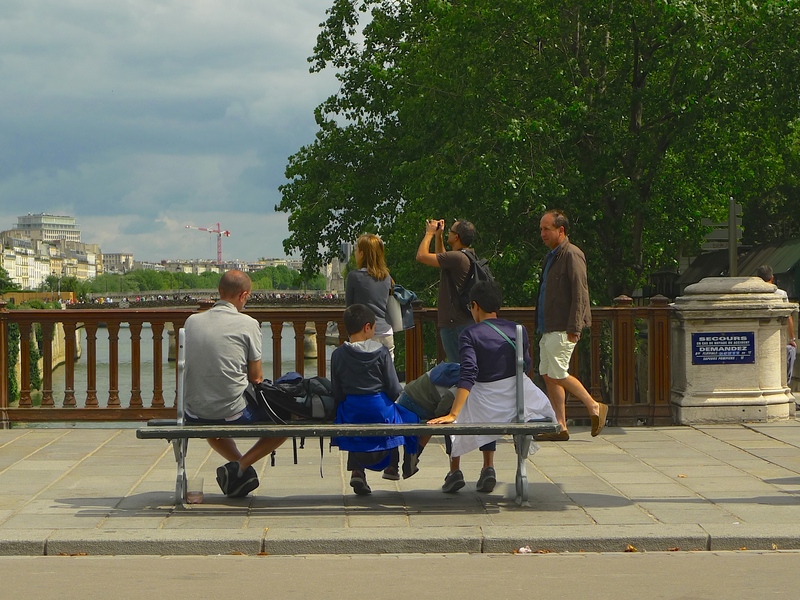 The young lady pictured above wearing her tap shoes and playing her ukulele together with the accordionist, who was reluctant to be photographed, gave a colourful perspective to the soundscape but it was the sounds at the beginning and at the end of my exploration on top of the bridge that really fascinated me. 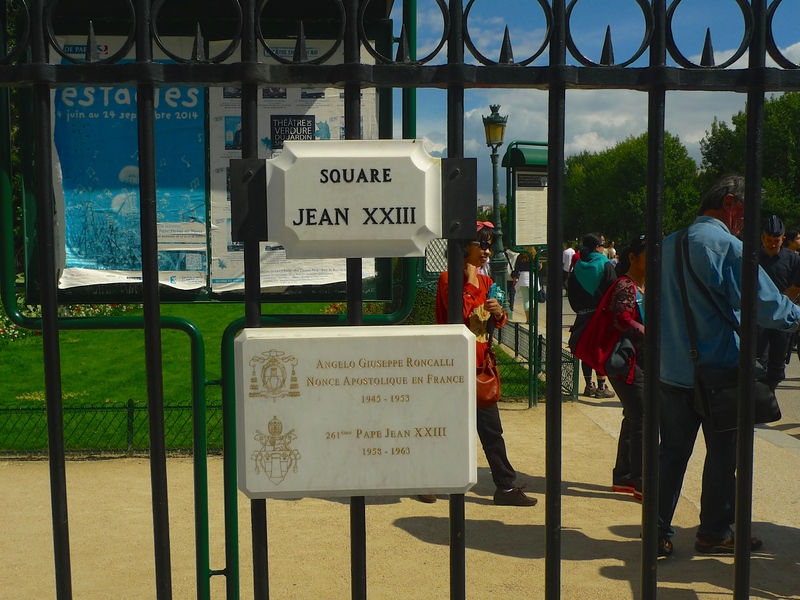 At the northern end of the Pont au Double is the Square Jean XXIII, a park named after Angelo Guiseppe Roncalli, Papal Nuncio in France from 1945 to 1953, who subsequently became Pope Jean XXIII. I began and ended my exploration on top of the Pont au Double here and it was here that I found two very similar but contrasting sounds. The chorus of the tourist’s voices, mostly Chinese (or were they Japanese?) outside the park at the outset seemed to contrast beautifully with the chorus of the birds hidden in the foliage in the park at the end of my walk across the bridge. The sounds of the boats passing under the bridge, the sounds of the street musicians and the sounds of the tourists on the bridge are certainly characteristic sounds of the Pont au Double but they are transient sounds, they come and go, they vary day by day and similar sounds can be heard on and around several other Parisian bridges. For me, it is the sounds of the birds that are the unique sounds of the Pont au Double.